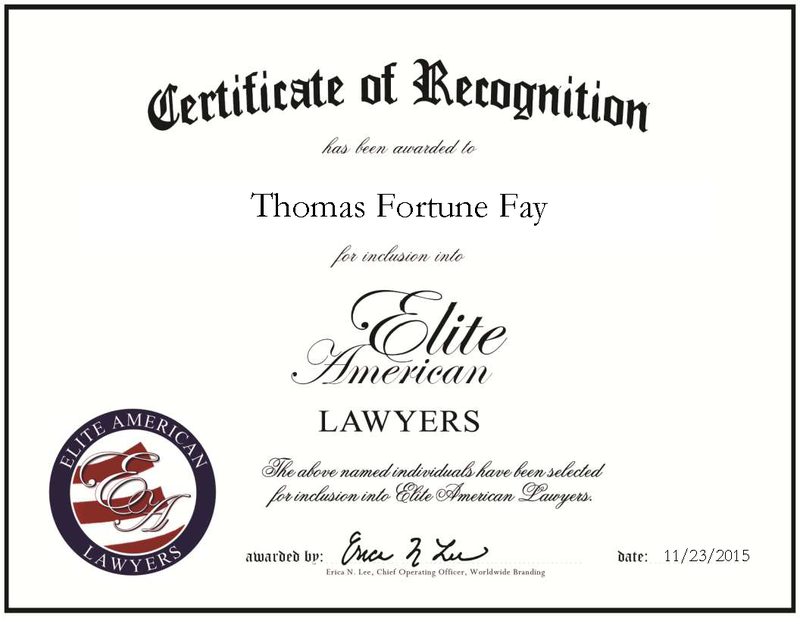 Washington, DC, November 23, 2015, Thomas Fay, Partner and Attorney for Fay Kaplan Law, PA, has been recognized by Elite American Lawyers for dedication, achievements and leadership in legal services. With a unique expertise in terrorism law, Mr. Fay has been practicing law for the last 48 years. He also specializes in personal injury law, where he takes on cases regarding wrongful death, motor vehicle accidents, medical malpractice and other negligent circumstances. “Personal injuries can lead to a complete change in daily lifestyle when catastrophic and traumatic; it’s my job to make things right from a financial standpoint to help ease the burdens caused by another,” Mr. Fay says of the fuel behind his professional passion. Mr. Fay earned a JD from the Rutgers School of Law in Newark in 1968, a Bachelor of Laws in 1965 and a Bachelor of Arts in 1961. He was admitted to practice following his education and has since established himself as a recognized leader in the field. In his career, he served on the elections committee for the Bar Association of the District of Columbia and he was a state committeeman for the region. Additionally, he served terms as vice president and secretary of the Trial Lawyers Association of Metropolitan Washington DC. Today, Mr. Fay continues in his affiliations with these organizations and he is a longstanding member of the American Association for Justice. In recognition of his professional excellence in his career, Mr. Fay received an AV preeminent rating from Martindale-Hubbell. He was also the recipient of the American Jurisprudence Prize for excellence in commercial law. When he isn’t dedicating his time to his career, Mr. Fay spends time with family, his number one support system. He also volunteers as a member of the Board for No Greater Love ministries. This entry was posted in Personal Injury, Terrorism Law, Wrongful Death and tagged American Jurisprudence Prize, AV Preeminent Attorney, medical malpractice, motor vehicle accidents, negligence. Bookmark the permalink.